Humphries, 85, has not responded to the festival's decision. He has previously said his comments were misinterpreted, but they have been criticised by other high-profile comedians - including former Barry Award winner Hannah Gadsby. Humphries co-founded the Melbourne International Comedy Festival in 1987, and it is now one of the world's premier comedy events. Its top prize has been named in his honour since 2000. On Tuesday, festival director Susan Provan said in a statement: "It is time for the award for most outstanding show to be in our name to celebrate the city that inspired the growth of our festival and its outstanding artists." She told the Australian Broadcasting Corporation that Humphries' recent comments were "not helpful" and had helped instigate the decision. 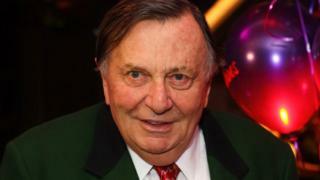 "I don't agree with a lot of the things Barry Humphries has said recently," she said at the time. "It is not something I will walk past. With full respect, I would like to accept this award just for me."